1. 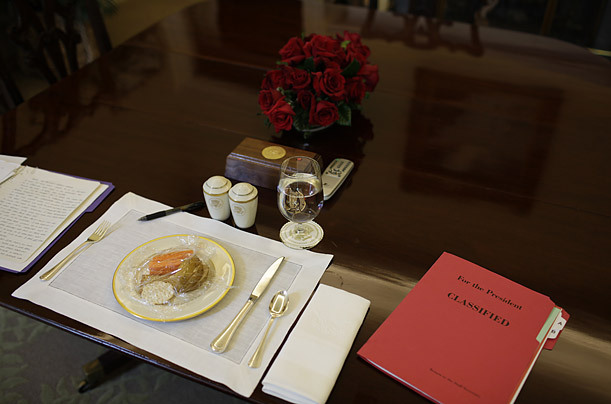 This photo is an early morning shot of the President’s breakfast table in the Oval Office. A few questions come to mind. Who makes his breakfast? Does he get to choose? Does he really eat it? What if he wants a McGriddle instead? And what is that he’s having for breakfast? It looks like the rejects from a hotel buffet bar. And of course, the main question I have: What is in that folder?! 2. How much do you love this photo of Obama cutting up? In this photo, he was telling the story of someone who approached his entourage in London and was extremely excited about seeing–Obama’s aide, Reggie Love. 3. Obama taking a call. Question: Who is he talking to? I can’t see him talking to a world-leader with his feet up. Kicking it with Michelle? Nah. I’d love to know. I also want to know where exactly this location is. It seems so unsecure. Though I’m sure it’s not. Um, last question on this photo. Is this where he takes his smoke breaks? Okay. Well she’s clearly touching her. Hmmm. Can someone explain this to me? No one is allowed to touch the Queen like ever? Did the Royal Family put out a statement of disgust? I need answers. 6. Sasha, on the other hand, is just too much. Check out homegirl’s riding boots. I can’t even deal with this little girl. 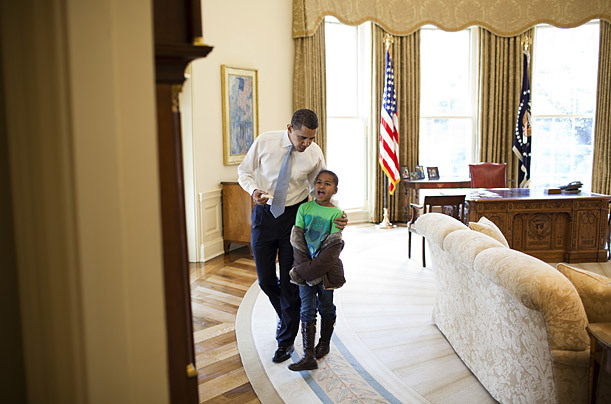 In this photo, taken soon after they moved in, Sasha had popped into the Oval Office to check out her dad’s new office. He congratulated her on knowing her way around the White House so soon. Again, I urge you to check out all the photos on Time’s website. They’re awesome. Right after I checked out these images, I got a Tweet with a link to a press release about a documentary that rapper KRS-One is appearing in. It’s called “The Obama Deception.” KRS maintains that nothing will change just because Obama is in the White House. I have a two year-old daughter who thinks it’s completely normal to see people who look like her in the White House. Things have already changed. Forever. dear readers: how much do you love these photos? And what do you think of the questions I’ve posed? *Okay, so it’s way more than 10 questions. Deal with it. This entry was posted on April 27, 2009 at 9:00 am and is filed under 10 Questions. You can follow any responses to this entry through the RSS 2.0 feed. You can leave a response, or trackback from your own site. WHO has the time to even analyze these pics. @anonymous: Someone’s got a case of The Mondays! Okay, I feel like I’m stalking you because I’ve left TWO comments already this morning. But I’m doing my morning run-thru of the Google Reader and your posts keep popping up. I loved the photos, especially the ones of him just chilling with his family. I love how in each photo, he and Michelle look so…normal. So relaxed around each other. True love at its finest. And you’re right, things have changed already. My daughter (who is 2 also) busts out a huge smile everytime President Obama is on the TV. She even recognizes Michelle now. “Obama’s President?” she asks me almost every day. People are sounding a bit angry, or at least annoyed at this post. Why? I wonder if another Stacy Dash photo would be more to people’s liking. I like the photo analysis and the more than 10 questions. There’s something about the Obama family that’s so regular, yet so special, and I think it goes beyond the color line. BUT, I would like to receive a copy of Black Enterprise or Essence that does NOT have a photo of Barack or Michelle on it. Enough of that now. 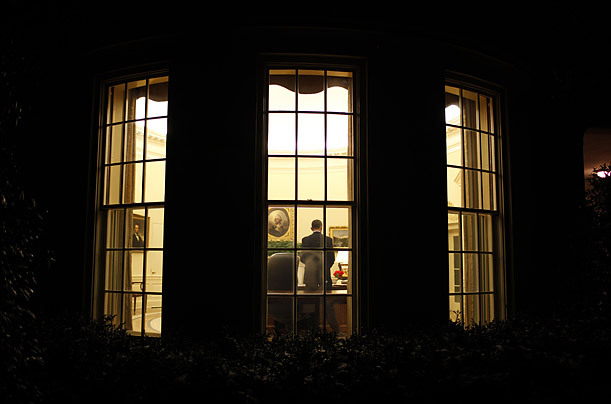 Love the photo of President Obama cutting up. Looks like he was about to the bust into the stinky leg. Breach of protocol to touch the queen. Then she needs to stay at home or behind some glass. KRS. I need to google ‘The Obama Deception’ before I left my blood pressure rise. Maybe there is a good message found in the documentary but no matter what, having someone in the White House that looks like me is real change. 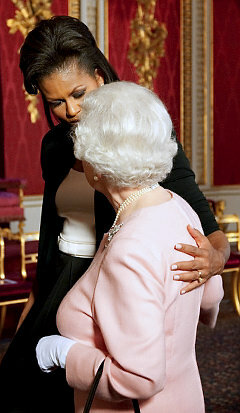 1- The proof is in the pudding-they replayed the tape and The Queen touched Michelle first. The Queen is getting too old to remember or care about protocol, lol. 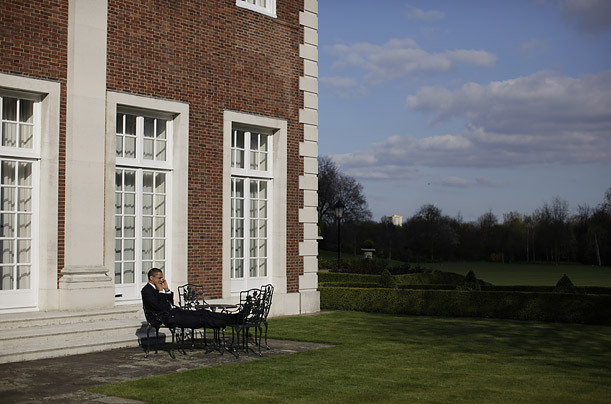 2-I’d love to know who he was talking to with his feet up. My favorite photos are of him and the family chilling in the White House-this is really HOME for them right now! Still surreal. Jobs, Tax Cuts, Health Care, Housing, Education, Clean Energy, Fair Pay, Iraq, Service. If you are no better off today than you were 100 days ago, you have been deceived. Why the negativity on such a great post??? If Fox News (eww!) can analyze how much media time President Obama received in his first 100 days, these pics can be analyzed as well. Hell, if you took the time to read the post, you have time to analyze them. Get a life and get educated. Anyway, I’d love to know what the conversation was between Malia and her parents. Obama is touching her face and hair which leads me to believe he’s giving her some encouragement about something. School? Overwhelming attention? Jealousy at school? I love how he just kicks back and becomes so comfortable in any setting. This is our first Black first family. Not only am I blessed to live to see it, but I can do so in my youth! I don’t think I’ll ever get tired of seeing or hearing about them, especially when it’s positive. KRS just wants some attention lol. how can you not believe there’s been even a slight shift in thinking because of obama. these photos are change. love them!